My name is Ray "Crash" Corrigan. I'd like to tell you a story, a true story, in fact it is the story of my life. It all starts back in the 1930's, when I was a physical culturist, and my job was to keep the stars of Motion Pictures in good condition. One day, while helping Dolores Del Rio, Cedric Gibbons of MGM spotted me and offered me a chance to go into pictures. Sounded all right to me, and soon I was a swimming and stunt double for the "Tarzan" movies. Eventually I graduated to bigger and better parts, and between MGM and other studios, I acted in over thirty films before signing with Republic Studios. At Republic they starred me in three serials, "Darkest Africa," "The Undersea Kingdom," and "The Painted Stallion." Incidentally, "The Undersea Kingdom" grossed over $50,000,000. Soon after, I became known as "Tuscon Smith" while starring in "The Three Mesquiteers." We also made 24 of these films and soon after I was signed by Monogram Studios, who gave me the starring role in "The Range Busters." They also made 24 of these. Since my career at Monogram, I have been lucky to be either starred or featured in over 30 films for various studios. But I am digressing, forgive me! During the time I was making one of "The Three Mesquiteers" and needing a change of pace, I went on a hunting trip. Always did like to hunt. While on this hunting trip, I stumbled on this picturesque and peaceful spot in the Simi Valley. These were the years when Motion Pictures had problems. Their problems were that they needed fresh ideas, new faces and different locations. Realizing this, thousands rushed to Hollywood. Already a carryover from the historic old west, this Simi Valley soon echoed once again to gunshots, racing stage coaches, pitched fights between the "Goodies" and the "Baddies." It was a time when the wildest stunts brought the biggest box office, when western heroes wore ten gallon hats and the "Bad Guys" wore black hats, blazing a trail of dirty deeds. Yet, it wasn't long before Motion Pictures matured. In 1937 I bought this ranch, all 2,000 acres of it, that is now the Corriganville Movie Ranch. I built my home here and just plain enjoyed the ranch, with time out to star in Motion Pictures. The film companies soon began to realize that the ranch offered such a wide variety of terrain, including lakes, mountains, mines, caves, villages, and other attractive facilities. 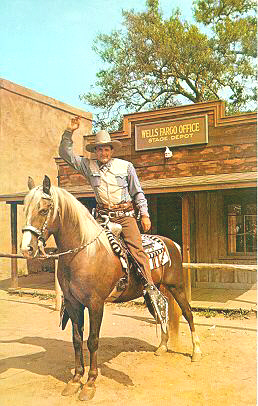 They took advantage of its historic western heritage and up to the present time over 3,500 films and television series have used the ranch at one time or another. Shortly after securing the ranch, I realized that it seemed a shame not to share this "Last Living Frontier" with others. Well, I decided to do something about it. Yep, you're right, I opened up the place for everyone to enjoy. Instead of the Ray Corrigan Ranch, it became known as Corriganville, where finally the mayor, sheriff, fire marshal, and editor of the Corriganville Gazette were all one man, yours truly. Almost forgot that I'm the postmaster, too. The United States Post Office realized that we are really a town and you'll find Corriganville, California in every post office directory throughout the world. You know, folks who come to Corriganville say that this place is timeless, and I guess they're right. It stands as an epitaph to an era, so rich in romance, so wild in adventure, that it has captured the hearts of many. Jesse James, General Custer, William H. Bonney (Alias Billy the Kid), are all gone, but Corriganville is still one place that exists to remind us of those days. While at Corriganville, I sure hope you enjoy the many historice and scenic spots and that you will be thrilled by the live re-recreations which are enacted on our "Silvertown" western street. These events (a different one every half hour) and others occur all day long. The actors and our entire staff will do their utmost to make your day worthwhile. As your host, I also pledge myself to do everything in my power to make your visit to Corriganville a memorable one. Well, so long and thank you for listening to my writings and I hope to see you in person at Corriganville.